Worrying can stop us from creating, be it drawings, stories or anything else. Don't worry too much. This pizza place name isn't anything fancy or cutting edge, but it works. 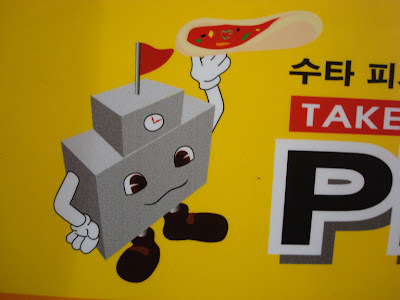 I wouldn't say the Pizza School mascot is the best drawing around or even the most memorable. But for some reason it really makes me laugh. It's a school that makes pizza! It's almost radical. I think worrying too much would have prevented this character from being created. So don't worry too much. You don't have to be perfect in order to create something that will make people happy. Just stop worrying and create! nice. :) I've noticed that kind of a thing with Korean signs and brand names and such. They work without necessarily making much sense.